Hastings was not a planned town by the Government- it evolved because the prominent land owner, Thomas Tanner, ran into financial difficulties in the 1870s. The first road formed in Hastings was Karamu Rd, around the late-1860s. It was an old Maori track. Thomas Tanner used the grid road system for Hastings when he laid out his street plan as he developed Hastings in stages. An anomaly from this was when Napier storekeeper E. W. Knowles purchased two blocks from Thomas and then subdivided his land into small irregular sections, and put two diagonal roads through them (Oak and Elm roads). This area became known to locals as “Knowles Folly”. When the population of Hastings was small, a postcard or letter addressed with the person’s name was enough to ensure delivery. As the town grew the Hastings Borough Council considered in 1893 numbering its streets. Streets running north and south would be called avenues and east and west should be called streets, and all sections would be numbered. This never occurred. The next time numbering was mentioned was in 1908 when book store owner Mr G. Spencer Clapham said visitors were getting lost in Hastings finding people’s houses. He said if someone lived in Karamu Rd this could mean they could be near the gas works or Tomoana – in other words some distance apart. Hastings, he said, had long passed the village stage “where a stranger excites curiosity and where people collect to stare. In villages, a dozen or so voices will answer simultaneously to tell you where So-and-So lives”. Spencer believed not only did Hastings need a house numbering system, but a way of knowing where that house is situated in the street. The solution said Spencer – and one which is still with us today, is the Hundred System of numbering. Due to the regularity of size of Hastings blocks (short length of a street) in the road grid system, the Hundred System – according to Spencer – could easily be adopted. At some point, Karamu Rd (likely 1920s) was abandoned as the pivot for East and West divider and the railway line was used instead – as it is today. 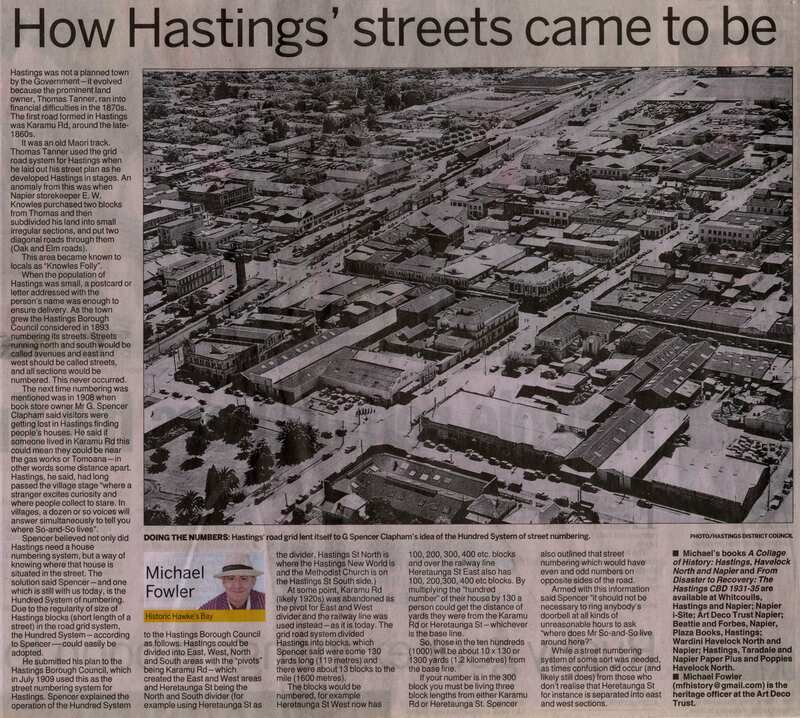 The grid road system divided Hastings into blocks, which Spencer said were some 130 yards long (119 metres) and there were about 13 blocks to the mile (1600 metres). The blocks would be numbered, for example Heretaunga St West now has 100, 200, 300, 400 etc. blocks and over the railway line Heretaunga St East also has 100, 200,300, 400 etc blocks. By multiplying the “hundred number” of their house by 130 a person could get the distance of yards they were from the Karamu Rd or Heretaunga St – whichever is the base line. So, those in the ten hundreds (1000) will be about 10 x 130 or 1300 yards (1.2 kilometres) from the base line. If your number is in the 300 block you must be living three block lengths from either Karamu Rd or Heretaunga St. Spencer also outlined that street numbering which would have even and odd numbers on opposite sides of the road. While a street numbering system of some sort was needed, as times confusion did occur (and likely still does) from those who don’t realise that Heretaunga St for instance is separated into east and west sections. Photo caption – DOING THE NUMBERS: Hastings’ road grid lent itself to G Spencer Clapham’s idea of the Hundred System of street numbering.